Finding a clinically tested or independently tested formula may be stressful, which is why our staff went ahead and outlined some of the best approaches on the market. However, The Spoiled Mama Tummy Butter for Stretch Marks does not claim its clinically tested or independently studied. We feel it’s important to find a product that has been proven to work in some studies. Cocoa Butter is a common ingredient used in several skincare products. There are several benefits of Cocoa Butter, but one common benefit is it’s a moisturizer. According to the manufacturer of The Spoiled Mama Tummy Butter for Stretch Marks, this formula contains pure cocoa butter with 11 nourishing oils that are intended to promote collagen and cell regeneration. However, the manufacturer does not claim that The Spoiled Mama Tummy Butter for Stretch Marks will improve the look of discolorations as a result of stretch mark development. Some products formulated for stretch marks offer this benefit. Finding a stretch mark cream that is comprised of quality ingredients at an affordable cost is often challenging and time consuming. We feel products with a MSRP less than $70 are more affordable then options that cost more than $70. Luckily, The Spoiled Mama Tummy Butter for Stretch Marks is cost-effective, and both options are sold for less than $70 online. As stated by the manufacturer, the eight ounce product size is the “Best Value” option. However, we did not notice any Buy 2, get 1 Free deals for customers who purchase more than one jar at a time. Some manufacturers offer this special to help customers save money on their order. To see some of these products, refer to the review grid below. The Spoiled Mama Tummy Butter for Stretch Marks contains an orange-chocolate scent. You can purchase this product in two sizes: a four ounce or an eight ounce. Use as directed to achieve best results, if any results may occur. However, there is no information implying that this product may offer results in as little as 2-8 weeks of applications. After looking at information published on the manufacturers website, we found that this formula is recycled, organic and vegan. Also, the manufacturer promoted this formula as a toxic-free approach. Massage Tummy Butter onto body twice a day, or as needed. Concentrate on areas that need extra lovin’ as baby continues to grow. 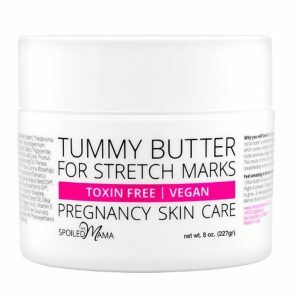 The Spoiled Mama Tummy Butter for Stretch Marks is an affordable option but does not state that it reduces the look of discolorations from stretch marks. You can buy this formula in two sizes, but the manufacturer does not claim when results are obtainable. You may want to consider options before you buy!